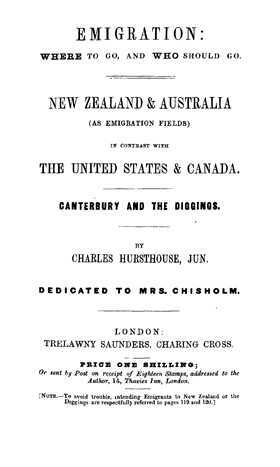 Emigration: Where to Go (Hursthouse, C. 1852) and who should go (1850s) was written up from the experience attained during a five years' residence on the spot. It firstly lists its own reviews by the press of the day including the Spectator, Leicester Mercury, Norfolk News, and the North of Scotland Gazette. The writer extols the virtue of migration over remaining in the UK living amongst armies of paupers, idlers and beggars, thieves and criminals, and prostitutes! An environment lacking food and suffering from prevalent disease, living in filthy towns and cities plagued with rats, cats and dogs! Living in an environment where the average tradesman lacks customers and thus an adequate income to feed his family and yet has to support the poor and idle by his taxes! The argument then put forward for New Zealand is that it has none of the above impediments! A brief history of New Zealand is presented (starting at p29) followed by the natural features of the country (from p33), the Maori (p36), the towns (p43) including Auckland, New Plymouth, Wellington, Nelson, Canterbury, and Otago. The book concludes with a series of appendices to strengthen the case for emigration. Useful tables relating to climate, disease, positive letters from settlers, appropriate apparel and needs for the voyage, housing, and even travel insurance are to be found in this section.